I still cannot believe it. I was stunned when I found out that Foodie Sarah had nominated me for the Blog North Awards for the best food and drink blog. (Thank you very much Sarah!). 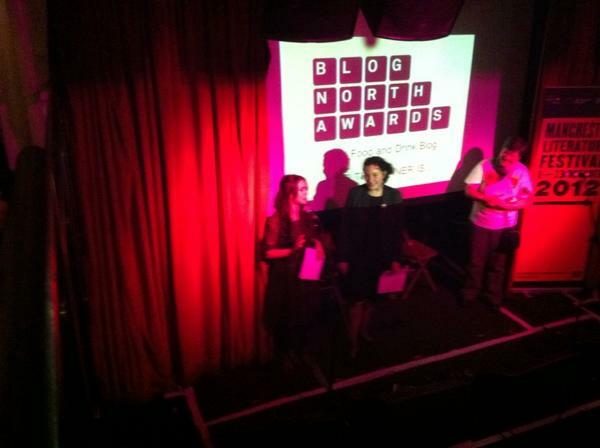 I was ecstatic to discover that I had been shortlisted from 400 other nominated northern blogs down to 5. So I almost hit the floor when I heard my name announced as the winner of the Best Food and Drink Blog at the awards ceremony in Manchester last week! I had toyed with the idea of going to the awards but thought that I would never in a million years actually win as the other shortlisted blogs are really fantastic. And also the other categories too! I came to the conclusion that I would go along for the sheer delight and experience of being shortlisted and to visit my friends Josh and Mark too. BEST DECISION EVER. We were treated to some wonderful readings from other shortlisted bloggers, my favourite being Victory Garden a Hudderfield postie with a very entertaining blog of his observations of northern folk encountered en route. 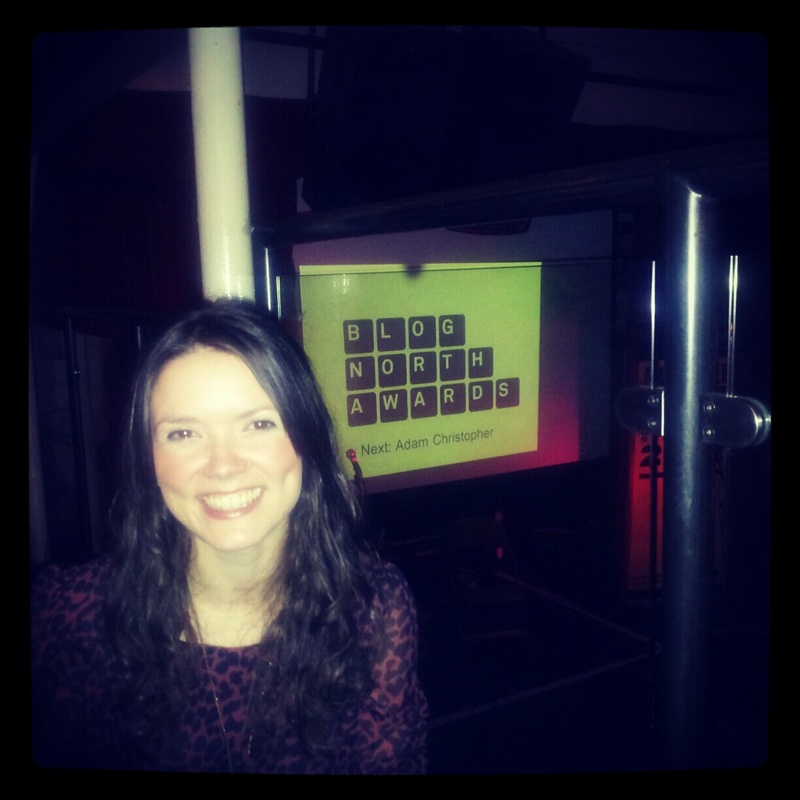 It wasn’t until the second interval that I started to feel a bit nervous…. The brilliant Culture Vulturess , who I’ve been following on twitter for quite some time, announced the winner of the Food and Drink Blog award and I did a little squeak and staggered down the staircase and up on to the stage, to babble my thanks and amazement at winning. I’m not entirely sure what came out of my mouth at this point but I know I thanked everyone, A LOT. And then my legs realised that I was on stage, speaking in public and momentarily refused to work to get me back down the stairs and off the stage. Once I regained the use of my limbs, I trotted off in a happy haze clutching my winners envelope, with a £50 cheque, a year’s web hosting and a winners badge to adorn my blog. Wow! Can you tell how OVER THE MOON I am??! It still feels like a dream and I’m still (almost a week later) smiling very widely. Who would have thought a year ago that I would be half way around the world in 80 bakes and the winner of a Blog North Award?? I could never have dreamed this would happen. I cannot thank you all enough. Thank you for reading, thank you for voting, thank you encouraging me! Thank you for sampling my sometimes bizarre and experimental cakes! Thank you for a memorable and inspiring evening. I thoroughly enjoyed the relaxed and intimate event and had the opportunity to listen and chat to some very talented people! I am such a lucky girl. I came away even more excited to continue blogging and baking and to complete my challenge. Bring on the next 39 bakes! Just in case you want to know more about the awards you can find more details on the blognorth website here. Thank you so much!!! there’s lots of exotic and experimental baking to follow very soon! Thank you so much for reading! Thank you so much Sharyn! VERY happy times indeed! I feel especially blessed and honoured. This year has been amazing! Thank you so much for your continued support. I’m so pleased to have discovered your blog and friendship. Congrats!! That is so exciting :)) You totally deserve it! Thank you so much! That means a lot to me. Who would have thought that this time a year a go I would end up here? It’s been an amazing adventure so far. I’m so pleased I started blogging, it’s opened up a whole new world of wonderful people, friends and inspiration to me. Thank you so much for reading and your encouragement and support. Congrats on a well-deserved recognition for your blog! It was not surprising that you decided to get a domain name couple of months ago 🙂 Keep on baking!